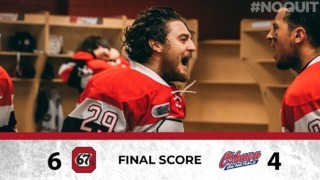 Michael McLeod notched his first career OHL hat trick as the Mississauga Steelheads pounced on their chances and took away a 6-1 win over the Ottawa 67’s Tuesday night. The win helps Mississauga to a three-point lead in the OHL’s central division standings, placing them second in the eastern conference. Ottawa sits seventh in the east. Brown said it’s been a “whirlwind” since the winter break, and the team just needs a couple days of practice to break their current eight-game losing skid. Aidan McFarland and the Steelheads would get off to a hot start, beginning the game with a goal a minute and a half in. McFarland was the beneficiary of a nice play by Michael McLeod on a three-on-one. McLeod was in between his two teammates, and let a pass slide under his stick to get the puck to McFarland for a 1-0 Mississauga lead. Jacob Cascagnette and McLeod would add more before the end of the first period, with draft eligible Ryan McLeod drawing an assist on both of those Steelheads markers it was 3-0 for the visitors through one. Ottawa would get on the board toward the end of the second, with the score at 4-0. It was newcomer Chris Martenet registering his first goal at TD Place, on a one-timer from the right point. 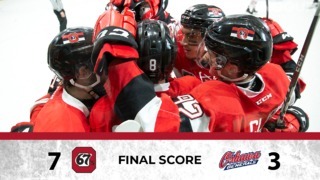 That put the 67’s down by three. Mississauga would re-take control of the game, however, and put up two more goals before the final buzzer. The 67’s don’t get much time off, and will return to the ice tomorrow night to continue their stretch of seven games in 11 days. 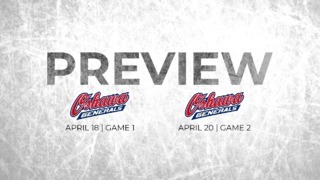 The Kingston Frontenacs will travel to the Arena at TD Place, with a 7 p.m. puck drop.